While you’re solving the mystery of the Miller Park boom, try your hand at crunching this cobblestone numbers game found on E Howell between Belmont and Summit. 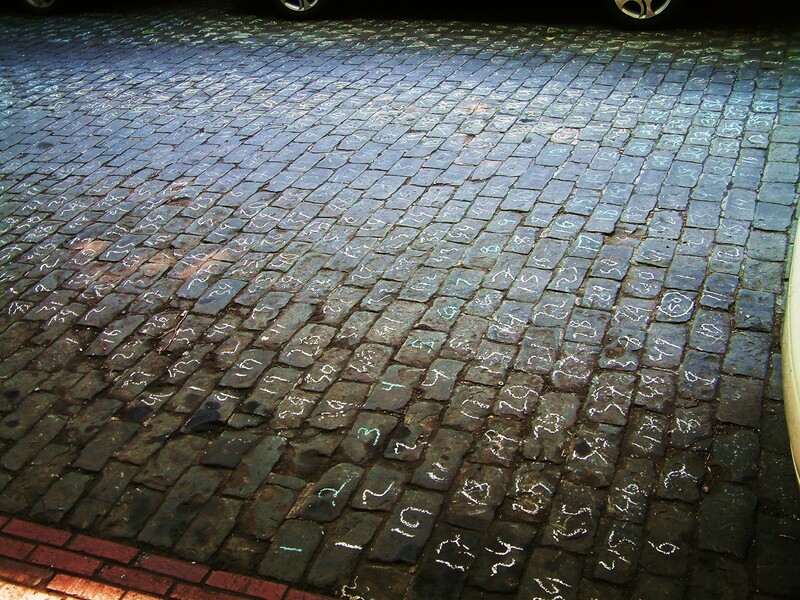 I found most of the cobblestones numbered in chalk from 1 to 50, with each number 50 circled. If the devil is 6, then god is 7. Can you explain the rest? I snapped a photo of some chalk writing on a wall near there that said “you are asleep” the other day. The mind of a deranged 5 year old with access to sidewalk chalk???? …was one of Ron Howard’s many crimes against cinema. Especially loathesome since it got such fawning reviews. Kudos to CHS for sniffing out the failure. They are *not* cobbles! 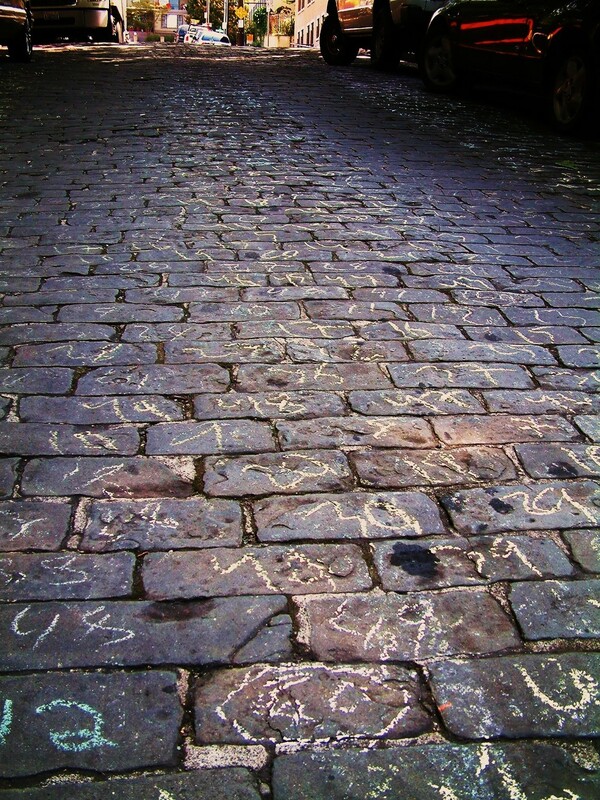 Cobbles are round. Those are bricks. a naturally rounded stone, larger than a pebble and smaller than a boulder, formerly used in paving. Say it; don’t spray it. Although, I do appreciate your commitment for proper word usage. Okay, technically they’re cobble setts, not bricks. But that still doesn’t tell us what secret message this tweaker was trying to send to the mothership. A friend suggested that this was just an elaborate game of hopscotch. They are indeed cobble stones … your concept/definition is flawed. Still used in many parts of the world, a smaller version, square and granite, millions shaped for use in the vast boulevards of Paris, laid in sweeping curving patterns. No, no – not brick, but stone. Brick is ceramic, clay and binder mixture, man made and fired in kilns. 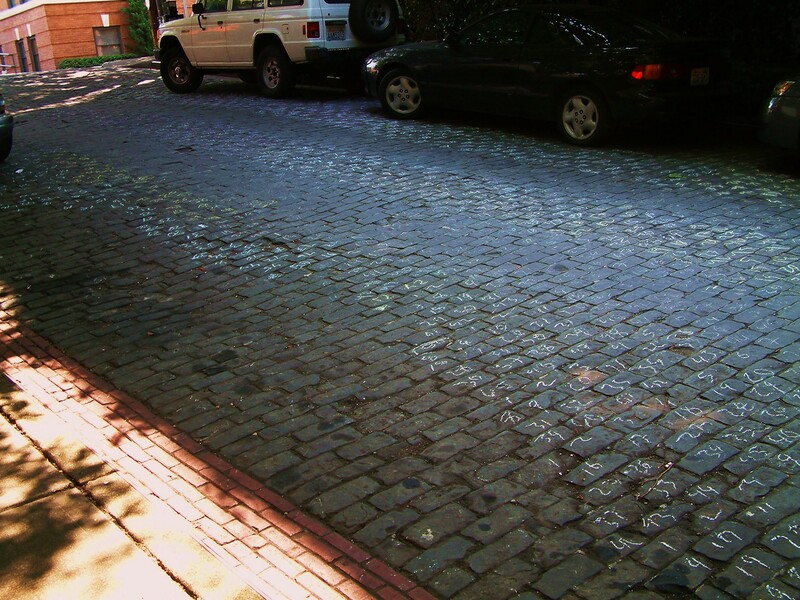 Then, bricks of all sizes and colors, are used in many ways, including paving in past era street construction. I walked by some people doing it late at night. But not too late, the Redwood was still booming. They were filming it. Should have asked. No, even your definition says it right… they are ROUNDED not round. The top surface is rounded. It’s not the shape of the stone, it’s the surface.